Here is your page. A place for you to tell how you handled a difficult situation, overcame a stressful challenge, or helped a bride with an impossible problem. 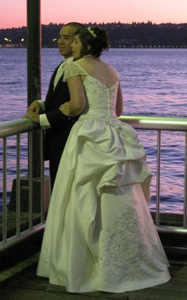 Wedding gowns, like any other ready made garment, have sizing variations in each gown. If you go to any garment store and try on any 2 dresses in the same style and size they will not fit the same. The main problem with the bridal industry is that the measurement and ordering process makes people think these gowns are Special Made. They are very much not. They are mass produced just like all other garments. The only reason for the special ordering process is that the gowns are expensive to stock for the retailer. Measurements are taken to figure out what size is closest to you, not what will fit you best. What the sale's lady told you is mostly true, "All gowns get altered". In my 26 years of working in the bridal industry I have seen very few gowns that needed no alteration. If you had access to that gown you tried on the first time I would say buy it, but since you don't you have to resign yourself to the fact that any gown you order will need altering to get the same fit you had in the first gown. One more thing that many folks don't know. The fabric used to make these gowns has embroidered patterns already sewn on it. The company making the gown has no way it change the size of this pattern once it is set. This is why many gowns do not come in smaller sizes. Some of the embroidered pattern would end up in the seam as the pattern pieces are made smaller and the embroidered pattern stays the same. There is no such thing as "redoing the embroidery". So, if you could order a smaller size it would look the same as altering the one you have. Yes, all too often the bridal industry doesn't care about the feelings of the bride, but it sounds like this store has been trying to do it's best for you. They are limited in what they can do by the manufacturers and distributors. They are so many people telling you so many conflicting stories. If possible, I would find an independent seamstress to look at you in the dress and give you an unbiased opinion of what can be done. Thank you for sharing your story. I love the picture and your creativity! Thank you for the wonderful web pages on bustles, I found them on a Google search and from the information and pictures you provided I was able to bustle my own wedding dress and I think it turned out great! This was my first time bustling a dress and I really wanted to be able to show off the embroidery and beading on the back, but I loved the look of the under-bustles better than the pick-up over-bustles, at least for the style of dress that I have. I think you might call this a double-French-under-bustle with a couple extra points on the sides. I used two gross-grain ribbon loops and a tie going down the center back, two loops and a tie down each side back and then an extra loop and tie near the top on each side to catch the extra fabric on the sides of the gown. I also had to work with the zipper on the dress (it ends just above the upper bustle fold) where the lining and outer fabric are connected, which is also where the netting starts between the lining and fabric. What a wonderful picture! I can tell you had a happy wedding day. I do agree - your bustle looks great! I came across your web site looking for ideas for sewing rooms. (I am remodeling my home and have a guest/sewing room. I don’t want all that space dominated by a bed that may be used 10 days/year. Solution: Our professional cabinet-maker/son-in-law is building a wall bed that will stand 20” deep from the wall and have a two 18” drawers below and adjustable shelves above on one side. The spacious area that opens to form the bottom of the bed will become my design wall/quilt display space. The rest of the room it mine. Win-win! The reason I am writing it to you a story about the pregnant bridesmaid problem. On Valentine’s Day 1996 our daughter announced that she would be getting married the following summer, 17 months later. The following month we learned that the garden she wanted for the wedding had an unexpected opening for that same summer so we started planning the wedding for July 21, just 4 months later. My daughter wanted a very simple dress and I offered to make it. But we could find nothing simple enough to suit her among the patterns we browsed. So she ordered a silk sheath maid’s dress that she would dress up with the bouquet and veil. I advised her that this would still be very plain. But this is what she wanted so she ordered it with the assurance it would arrive in 8 weeks. Maid #1 found a dressmaker and her dress was finished in 1 month. Great! Maid #2 was our other daughter. I agreed to make her dress because I’m her mom and wanted to. Finished in one weekend… no problem. Maid #3 was a new college graduate and without a job, couldn’t afford the dressmakers she called, so I made hers about 2 weeks later. Still on a roll. Maid (matron) #4 was pregnant at the time she was selected and would be 7 months at the time of the wedding. I selected a maternity dress pattern that was very similar to the other dresses. bought her an extra yard (60” wide) of fabric and off she went. But the dressmaker she chose told her it could not be laid out with the amount of fabric I supplied. I looked it over and told her it COULD be done and I would do it for her. By making and inserting a 1.25” self-fabric sash into each side seam, it was easy to tie a bow to adjust the fullness and from the front and in the photos, it is impossible to tell her dress from the others. I was proud and by mid- June, all the maid’s dresses were finished. Whew! In mid-June the bridal shop called to say the bride’s dress had arrived. Liz tried it on and in the mirror I saw her face fall as she said “You were right, Mom, it’s way too plain.” And of course nothing we could do about it. Ever up-beat, I told her we could get right back in the car, drive to San Francisco (25 minutes) and buy the pattern and fabric for the dress she liked the most. I had a 4-day weekend coming for 4th of July and agreed to make it if she agreed to come by for fittings on demand. We returned home with 9 yards of silk and a crazy sense of exhilaration/trepidation. We agreed not to tell anyone what we were doing because I didn’t want to endure the chorus of “You’re crazy!!”. I treated myself to a new pair of Gingher shears and the dress was finished with 1-week to spare. The wedding was beautiful and my only regret was that I had not made all four maids’ dresses. Dress #1 that was made by the dressmaker screamed “home-made”. Examining it later showed that the lining and dress fabrics had been sewn as a unit, bunching and pulling all the way. An amateurish shortcut that could not be disguised or hidden. Too bad. We put her in the background in all the photos. To this day, I don’t know how I did it. I was working more than full time and traveling as director of a start-up company -- it must have been sheer adrenaline that sustained me through this period. You have a lot to be excited for! And you've been smart to take it slow and do only what you can pay for. Bravo! Thank you for sharing your challenges. It's great to have something you worked hard for. Thank you, Thank you, Thank you. I just found your website and was thrilled to see the different ways you've created bustles. What you've shown helped me feel much better about the bustle I created for my daughter-in-law to be's gown. I signed up to do the bustle for her gown, as I thought it would save her a little money and time before the wedding. I thought, how hard could this be, I've been sewing for about forty (40) years and envisioned that ballroom bustle you described. However, when I actually started to work on it, I was in total stress. Her gown is more a-line with a shorter train. When I tried the ballroom style, it pulled the sides up really funny. So I sat and looked at the back of the gown for two (2) days before I just started working some pick up points to create a lower bustle. It was beautiful pinned, especially that I was able to work it so the appliques fell nicely. My next dilemma was how to affix them. I found little bows with pearl centers and sewed them over the hooks. With all of the appliques and beading, those bows disappeared. I guess I'll end up hooking her up before the reception, because I'll be the only one to know where the hooks are. Any way I just wanted to tell you what a wonderful website you have and to keep showing us such neat tricks of the trade. I've saved your site in my favorites because I know I'll have another project one day where your info will come in handy.